Transit advocates had been calling on the MTA to adopt metrics like "average wait time" to more clearly communicate system performance to riders. The new MTA dashboard will show the average amount of time that delays cost riders on platforms (above) and trains. Agency officials previewed the dashboard today for the MTA board’s transit and buses committee. The dashboard will display two new metrics — “additional platform time” and “additional train time” — which calculate service quality in rider-centric terms: the extra minutes that riders typically spend on platforms or trains compared to a scenario in which service operates perfectly according to schedule. Transit advocates have been calling on the MTA to adopt this type of metric, which is considered best practice in the transit industry, to more clearly communicate system performance to riders. Riders will be able to look up the new metrics for each line, and for the system as a whole, going back to July 2016. Providing these metrics was one of the top requests from transit advocates when newly-appointed MTA Chair Joe Lhota announced plans for the dashboard in July. Advocates applauded today’s announcement while noting a few omissions they want the MTA to address going forward, including historical wait time trends going back farther than last July and wait time metrics for buses. (Which can be done: TransitCenter worked with grad students at NYU to produce a beta version of a wait time dashboard for buses, using publicly available BusTime data.) Cafiero said the agency will continue to refine and improve the dashboard after its public release on Wednesday. 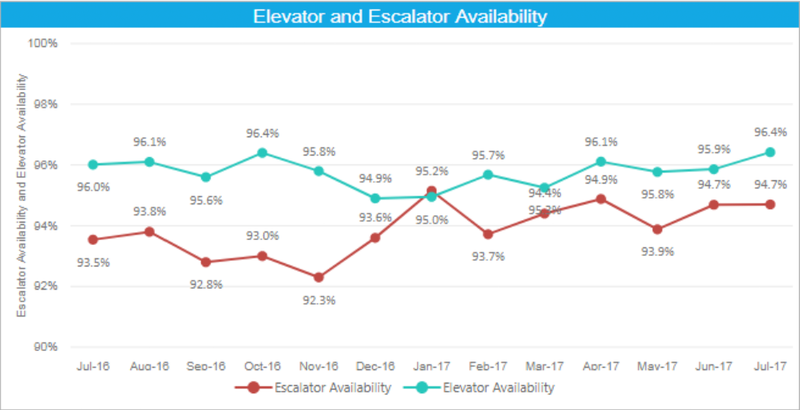 The dashboard includes a few other new indicators, including a measurement of how long elevators and escalators are out of service. Also included: “major incidents” — sources of delay broken down by subway line; “capacity provided” — the proportion of scheduled trains that actually arrive within a given amount of time; and results from subway car and station cleanliness surveys. Several other metrics are grouped under the heading of “legacy indicators” that the MTA has been measuring for decades. These include the service metrics that make more sense to MTA managers than riders, as well as key maintenance metrics like the average distance between mechanical failures on trains. One missing piece appears to be a progress tracker for capital projects and major maintenance work. That information is supposed to be provided on the MTA’s existing capital program dashboard, but the agency stopped listing the original project timelines, rendering it next to useless. As Reinvent Albany’s John Kaehny told Streetsblog in July, the only ironclad way to ensure the continued publication of MTA performance metrics is to codify it in law. Can we take this as a major victory? Congratulations to all those who pushed the MTA to be more transparent. The first step to fixing a problem is documenting it. These new metrics go a long way towards that. Glad they are putting WA on the last page of this site… it has so many problems. Bunching doesn’t cause WA to decline, because passengers don’t have to wait long for a train. However, bunching implies that there are also gaps in service, and that, therefore, some trains are more crowded, even if ridership is declining. If more emphasis were to be placed on terminal OTP, headways would improve, because the schedule is designed for proper headways, merges, loading guidelines, crew constraints, and so on and so forth. But, leadership continues to believe a myth that WA is more important than OTP. They think that passengers care more about waiting for a train than they care about waiting on a train, even if the train is delayed. But the vast majority of passengers are on trains, not platforms. WA also looks better during late nights because it is percentage-based, so a train that exceeds the scheduled headway by 5% at night is going to be a lot later (and rarer) than a train that is 5% late during rush hour. Would anyone really argue that late night service is better and people aren’t waiting a long time? No. MTA argues that OTP is a problematic indicator because it is pass/fail, and because the subway is not a commuter railroad, where passengers manage their expectations through a timetable. Instead, subway passengers care about trains arriving quickly, and about gaps. Pass/fail is problematic, but it could be easily remedied by switching to journey time. No one is holding us to these indicators. Also, subway passengers don’t manage expectations through a timetable because the system has poor OTP. But, even if passengers don’t check the subway schedule, it is still important to have good OTP, because it means that there are fewer delays. Also, while most subway passengers don’t ride terminal to terminal, most commuter railroad passengers don’t ride terminal to terminal either; delays are felt along the line, and slower service means a slower city, and lower quality of life. Managing to WA harms OTP, but it also harms WA. For instance, if there is an incident and a train is delayed, oftentimes, trains ahead of that incident will be held. Yes, this impacts OTP, but it also creates a gap in service. For reasons aforementioned, WA is less sensitive to change (and it will be made even less sensitive), but both of these indicators tend to improve or decline together. After all, headway adherence (WA) is essentially a form of OTP. Holding trains for evenness harms WA because WA is not the same thing as evenness. WA is the percent of intervals between trains that are not more than the scheduled interval +25%, and it measures gaps in service along multiple time points of each line. Evenness is not WA. WA is schedule adherence; the schedule is not necessarily even. When trains are held for evenness, it harms WA and OTP. During incidents, evenness matters. Otherwise, schedule adherence matters. Recently we got all of WA to be under electronic data, which makes it more accurate — this was a big deal, since leadership did not want to show prior electronic data for political reasons. We had calculated it for historical data and wanted to revise the old numbers, but they were worried people would think we were sitting on this data and not sharing it, even though we had only just figured out how to calculate it with raw track circuit data. So we ended up convincing them that we needed one set of data to not confuse everyone and that we’d actually be sitting on it and misstating fact if we didn’t release what we now had available. Wow, they have been reporting excess jtheirney time publicly since July! But it is still based on the schedule, so if a train is scheduled to arrive on a 10 minute headway and arrives in 11 minutes, it will be +1 minutes, even though a 10 minute headway isn’t ideal for the customer compared to a 2 minute headway, also with +1 minutes of platform waiting. It averages out for the whole system and takes ridership data. They have platform and train time… and remember, the average customer rides 1.5 trains so the total excess jtheirney time is arguably x1.5 what they’re reporting. Over all, they should be clear about their indicators. Some are better measurements of operations, and some are better for customers. I also think customers would check their schedule if it was reliable, especially at night and on the weekends. So they do care about schedules. Forgot… they also have planned work delays — these are the other delays which are increasing as much as the “crowding” delays, because supplement schedules often don’t account for how their flagging rules continue to slow down service. It takes a while for new ones to get implemented, for compliance to rise, so these rules should continue to slow things down in the future… especially as they get more maintenance work done and piggyback on top of projects, which is a good thing! I’d sacrifice OTP for planned work delays. They can maintain their system without shutting everything down at night. Will the MTA Put Better Transit Data to Work for Riders? Is Bus Service Getting Better or Worse? New MTA Dashboard Makes It Easier to Track. The dashboard includes important indicators of citywide service quality, but riders can't look up the specific routes they take. Is the MTA Doing Enough to Keep Its Subway Cars in Working Order? Subway trains are breaking down more frequently. Is it a sign of neglect of basic maintenance or a normal fluctuation in the lifecycle of trains? The MTA doesn't release enough information to provide a solid answer.